Of course, things were always better back in the day and you come off sounding like an old fuddy duddy when you bemoan the fundamentals (or lack thereof) in today’s NBA. But the real basketball purists – Charles Barkley and Kenny Smith – have had enough. And so have I. The comedy of errors in the last minute of Oklahoma City’s win over the L.A. Clippers was mind-boggling, especially since a number of them were committed by arguably the best point guard in the league, Chris Paul. 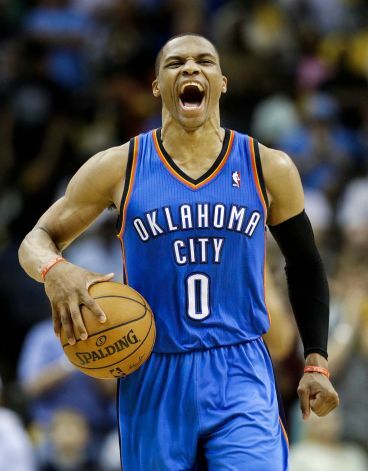 We’ve come to expect unorthodox plays from The Human Torch, aka Russell Westbrook or Dum Dum Number One, according to the Chuckster. However, when CP3 (Dum Dum Number Two) pulls not one, not two, but THREE bonehead plays in the final minute to help lose the game, it’s time to reflect. Throughout the years, new things come into vogue. For a while, it was headbands – still championed by Lebron James and the resurrected Al Harrington. Then it became shooting sleeves. And now, apparently, it’s fouling guys taking three point shots. There have been an unprecedented number of fouls committed on out-of-range shooters in the playoffs and an equally unprecedented number of three-and-one plays as well. Last night, Paul may have flicked Westbrook’s elbow on a likely unmakeable three, but the bigger sin was even coming close enough to get called for a foul. Repeat after me. You should never foul a jump shooter. Especially when he is five feet beyond the arc. You deserve whatever happens when you do. And I’m not even going to get into the Reggie Jackson bail out, when he ignored the obvious dish opportunity on a three-on-one break and tried to be the hero. Why Matt Barnes was reaching in made no sense, whether or not it was the worst call in playoff history (Doc Rivers) or if it was the proper call per the suddenly read by everyone on the planet NBA rule book (highly unlikely). It was a stupid play all around. 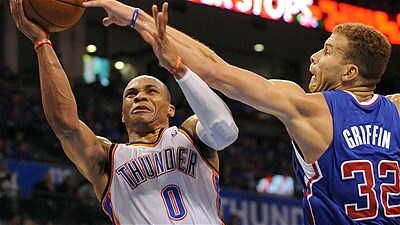 Some people consider the Thunder-Clippers matchup a great series. Right now, I consider it a battle of half wits, which is better than no wits, I guess. The winner of the series? The team that doesn’t go completely brain dead down the stretch like both have done in games four and five. 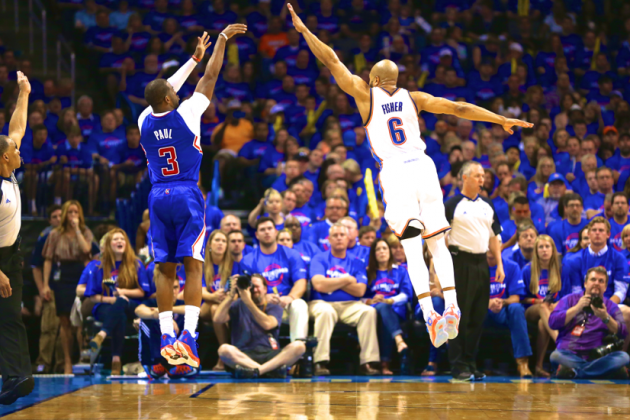 There are a pair of Batman and Robin’s on the court for the Oklahoma City Thunder – L.A. Clippers NBA Western Semifinal series and the argument rages on as to which duo is numero uno. On one side, Blake Griffin, third place in the NBA MVP voting, alongside Chris Paul, perennial all-star and arguably the top point guard in the NBA. On the other side, league MVP Kevin Durant and all-star human dynamo Russell Westbrook, who may be closer to the Human Torch than Robin. In game one of the best of seven Monday night in Oklahoma City, the combined numbers were fairly close but in the Clippers favor. Griffin and Paul combined for 19-of-30 shooting, 8-0f-9 from three-point range (all Paul), 9-of-12 from the line (all Griffin) for 55 points, seven rebounds and 15 assists. Durant and Westbrook combined for 18-of-33 shooting, 4-of-10 threes, 14-of-18 from the line for 54 points, eight rebounds and eight assists. The big difference in the game was the fact that the rest of the Thunder players combined to score three fewer points than Durnat and Westbrook combined, along with the fact that nobody covered Paul or the rest of the Clippers from three-point range as they hit a whopping 15-of-29. Griffin and Paul work more in tandem, feeding off each other’s offensive and defensive actions and knowing how to complement (and compliment) each other. Griffin sensed early in game one that Paul had the feeling, so instead of posting up and calling for the ball, he came high and set screens to get Paul free. For Paul’s part, as Westbrook put it, “He wasn’t doing anything crazy. He was just shooting threes.” Paul didn’t go out looking to have a big offensive game, but as just took what he was given. Clippers coach Doc Rivers described Paul this way. “He’s just very, very smart . He sometimes gets in the way with that because he’s thinking so much, but today he was in a great place,” said Rivers. “He played free without thought but when we needed him to, he did it. I thought his intuition was phenomenal. He knew we needed a good start and he got one for us. That’s why he’s just who he is. After playing a controlled game in the first round series finale against Memphis, Westbrook reverted somewhat to his Jekyll and Hyde ways, hitting most of his shots, but committing some unforced turnovers, six of them to be exact. Durant missed some chippies that he would normally convert and both he and Westbrook were part of the Thunder’s total defensive collapse. By the time the Thunder made enough contact with the Clippers to pick up their first team foul, L.A. already had 32 points and there was just over a minute left in the opening quarter. 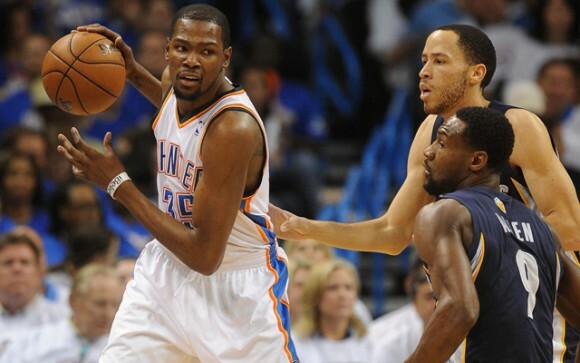 Durant knows the defense must tighten up. KD – From MVP to Decoy. Who gets the blame? Kevin Durant, almost everybody’s choice for regular season NBA MVP, scored the first two baskets in overtime for Oklahoma City in their loss to Memphis Tuesday night – and then didn’t touch the ball again until grabbing a rebound in the final minute. That was when he was fouled and missed the second of two free throws after referee Joey Crawford’s bizarre sprint and grab that disrupted Duran’ts concentration at the line. He got another chance to win the game in the final two seconds, but his long jumper missed and the Serge Ibaka follow was a half tick too late. So Oklahoma City, one of the favorites to represent the West in the NBA finals, finds themselves on the brink of elimination in the first round and the finger pointing is in full force. Whose fault is it? 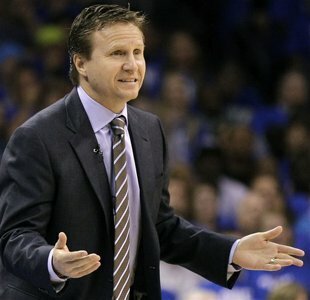 Is it coach Scott Brooks, who seems content with a “fling it and hope strategy” in last second situations? Is it Russell Westbrook for dominating the ball and sometimes being better than the defense in cooling off the league’s leading scorer, Durant? 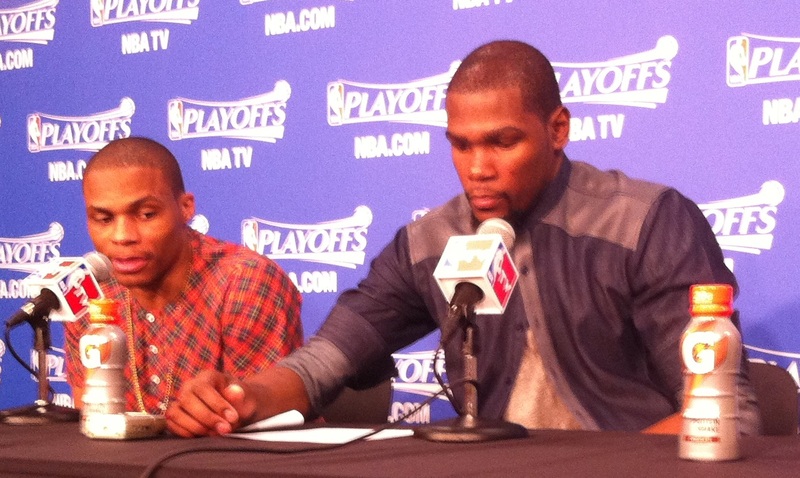 Or is it KD himself, for reverting to meek and mild status and not taking control of the situation. The sad fact is that it is probably a combination of all three and it will likely lead to the end of the Thunder’s season tonight in Memphis. In the aftermath of the fourth straight overtime game and third one the Thunder lost in the series, none of the trio instilled confidence in their ability to come back and win on the road to bring the series back to Oklahoma City. In addition to the three minute stretch in overtime where Durant was shotless after hitting two straight, he went six minutes in the final period of regulation without being involved while Westbrook, Derek Fisher and Caron Butler were firing up threes. Brooks’ explanation for the lack of touches by Durant was, well, lacking. His guys, especially Westbrook and Jackson, could find better looks by not flying out of control down the court and throwing up off balance prayers. The two combined for 12-of-38 shooting (31.6 %) and while Durant was right around 42% on his 24 shots, I’d rather take my chances with the leading scorer and MVP shoo-in taking most of that 14 shot differential. When asked if Durant is struggling mentally against the defense of Memphis’ Tony Allen and to a lesser degree, Tayshaun Prince, Brooks didn’t exactly say no. And I believe the children are our future, but that doesn’t make it so. Durant played almost 52 minutes Tuesday night – more than any other player on either team – and he is showing some signs of fatigue after four straight overtime games. That plays right into Memphis’ defensive strategy against him and Westbrook, who played 48 minutes on a still bum knee that saw him limping down the court on several occasions. 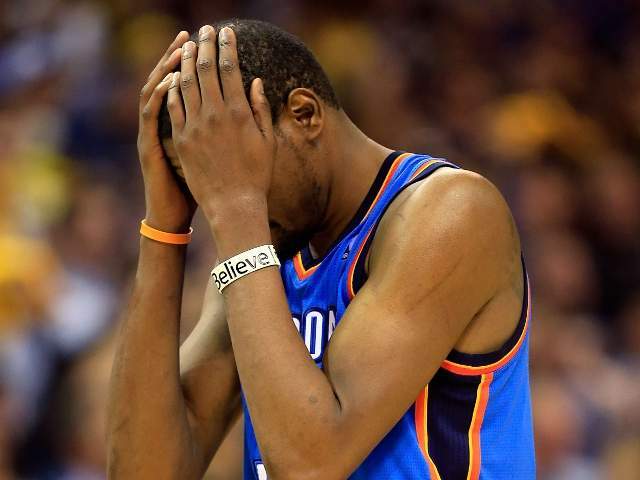 Durant concedes the Memphis defense has taken its toll, in part, because he hasn’t taken charge of his own game. First of all, Durant has to actually get the ball, something that has been difficult during the series, as those stretches without shots will attest. Secondly, you wonder if KD has the burning drive to make it happen. It appeared so during the stretch when Westbrook was out following the All-Star game, as Durant went on a scoring tear and started showing some Michael Jordan-esque desire. But since Westbrook has come off of his minutes restriction, Durant has sometimes turned back into a shrinking violet. 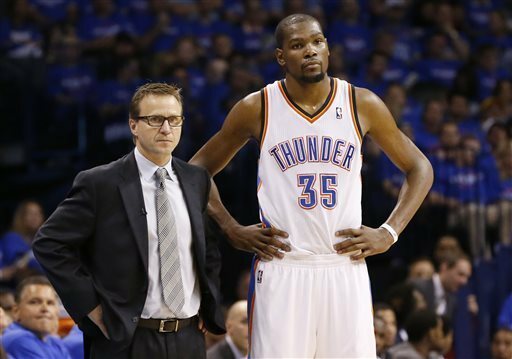 There is one cure for that and these comments make you wonder if Durant is ready to step up and take charge. Can you ever imagine Jordan, Bird, Magic or Kobe Bryant saying that? LeBron James at one point, maybe. But that’s where we are with Kevin Durant and unless he regains the fire tonight, the Thunder’s playoff hopes will be extinguished.